Stow Bardolph spans the eastern margin of the Fenland, situated 2km to the north and west of the town of Downham Market. The parish has two villages; Stow Bardolph to the east and the larger Stowbridge built on either bank of the River Great Ouse and its Relief Channel. The largest part of the parish is Stow Bardolph Fen, to the west of Stowbridge, which is criss-crossed by drainage channels. There are also a large number of houses on Barroway Drove, a minor road that runs parallel to the southern border of the fen and lies close to the outskirts of Downham Market. The parish itself has undergone frequent boundary changes since the end of the 19th century, with land being exchanged with Wimbotsham in 1882 and with Downham Market in 1884. In 1930 Stow Bardolph was finally reduced in size by 304 acres with the creation of Nordelph parish. The name ‘stow’ derives from Old English, and can translate as inhabited place, or holy place, however the parish gained the full name ‘Stow Bardolph’ due to being a settlement held by William Bardulf in 1244. Due to the nature of the landscape, the majority of the sites and objects noted in this parish have been recovered from the western area around Stow Bardolph and Stowbridge, with only a few small scatters on the fen itself. The earliest objects to be recovered are a number of flint flakes (NHER 2416), two Neolithic polished flint axeheads (NHER 2417), and a Neolithic flaked flint axehead (NHER 2406). There are also pottery sherds from the Bronze Age (NHER 2405, NHER 4227, NHER 32756), and of particular interest a Late Bronze Age socketed axehead with the remains of the wooden haft surviving (NHER 31471). Surprisingly, there are even fragments of Iron Age pottery (NHER 17575). Evidence from the Roman period has also been recovered, and this includes some pits containing Roman pottery sherds (NHER 2405), and a site on the edge of Stow Hall Park from which fragments of wall plaster from the Roman period have been recovered (NHER 17576), indicating the possible location of a Roman building. In addition two parallel linear cropmarks recorded on aerial photographs from 1976 have been compared with Roman roads or trackways. There have also been a number of objects dating to the Roman period recovered from the eastern section of the parish. These are dominated by pottery sherds (NHER 2405, NHER 17577, NHER 30818), although a small number of coins (NHER 15106, NHER 31513) have also been recovered, as well as a Roman pewter bowl (NHER 11260). Saxon evidence is more limited, although an Early Saxon cremation urn has been recovered (NHER 2414). Other finds are again limited to pottery sherds (NHER 17575, NHER 30819, NHER 30818), with only one other object, a Middle Saxon fitting (NHER 31513) recovered. The material evidence for the Saxon period may be poor, but in contrast the Domesday Book gives the parish a reasonable value and mentions a relatively large number of livestock and horses, as well as a fishery and a church. The only surviving site that the Domesday Book reference can be associated with is the Holy Trinity Church (NHER 2433), although it has no obviously Saxon elements. The earliest remaining parts of the building are the tower base and part of the north wall, which date to the Norman period. The church also has a 14th century chancel arch and door, and the upper part of the tower and former porch are of Perpendicular style, possibly as late as 1509. R. Brandon rebuilt the building between 1848 and 1850, and the organ chamber in 1869. Brandon's work is an important early example of Gothic Revival. Of particular interest is the Hare chapel of 1624, which contains a nationally important set of memorials to the Hare family, who held the manor here since 1557. 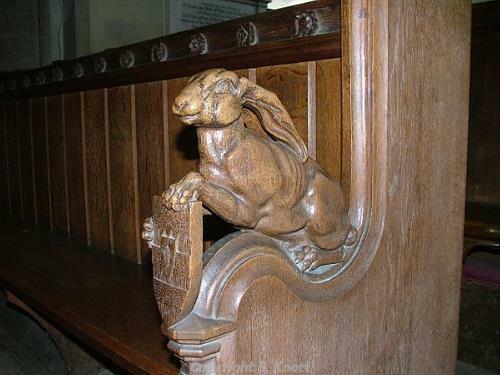 Indeed, the 'Hare' theme is visible throughout the church, a good example visible in this photograph of the choir stalls. The chapel contains a number of memorials as early as 1623, as well as the only remaining wax effigy outside London. The 20th century church of St Peters (NHER 2393) now holds a 15th century font that originated from this church. Other sites include a number of cropmarks of features thought to date to the medieval period, such as ridge and furrow marks (NHER 25345, NHER 25344, NHER 35583) as well as two possible moated sites (NHER 2429, NHER 16146) and Old Podyke Bank (NHER 13279), a 12th century bank much altered and repaired. Objects from the medieval period are again dominated by pottery sherds (NHER 17575, NHER 30819, NHER 32756), although there has been a small concentration of metal objects recovered from an area just to the west of stow Bardolf village. A silver groat of Henry VIII (NHER 11406) as well as a penny of Edward I, minted between 1272 and 1307, have also been recovered from the parish (NHER 28382), and from the post medieval period a hoard of eleven silver and nine copper alloy coins, minted between 1603 and 1625, has also been recovered (NHER 4229). The only other medieval site in the parish is Stow Hall (NHER 2430), a building of 1873 built on the site of an earlier medieval hall. It was demolished in 1994, but the lodge of 1883 survives and has been listed by English Heritage. Also still extant is Stow Hall Park (NHER 30524), which may have been a deer park during the late medieval period. It is recorded as a park in a source of 1734; in 1794 an avenue and pond are mentioned, with the present layout designed in 1797 by John Kennedy of Hammersmith. Planting took place in the main park until 1820, and on the south vista until 1840. The avenue and pond were removed, and trees thinned out in the late 19th century, but there have been no real changes to the layout since 1889. Other buildings of note include the Almshouses (NHER 2428), originally built in 1603 and rebuilt in 1870, and The Hare Arms (NHER 46857), a public house dating to the mid 18th century and later. Also of interest is Tong’s Drain (NHER 23225), an artificial watercourse built by Vermuyden in 1653 from Salter’s Lode to Stowbridge in order to relieve pressure on the River Great Ouse. Due to the local landscape there are also a highly unusual number of drainage mill sites recorded (NHER 14515, NHER 16321, NHER 16330), numbering eight in total. Unfortunately none of these buildings have been preserved, but 18th and 19th century maps indicate the positions they occupied. Largely positioned along the course of the Common Lode drain, these buildings must have dominated the local landscape during the 18th and 19th centuries. Also recorded in a similar manner are the sites of two post medieval brick kilns (NHER 36524, NHER 16318). Contemporary with this Victorian boom is the East Anglian Railway (NHER 13594), originally known as the Lynn and Ely railway, which was opened in 1847 and remains in use. The stations at Downham Market and King’s Lynn are both listed by English Heritage. Interestingly, there is also an early 20th century church in this parish. St Peter’s Church (NHER 2393) is a small mission church built around 1908 to the designs of E. Douglas Hoyland of London, in terracotta blocks supplied by the Bristol Fireclay Company. It was built for the Revd. J Percy de Putron as a ‘New Mission Church’ in the western part of the parish to serve the growing rural population. It is thought that the Church Army were involved in stirring interest, but little is known about the origins of the church. Little is recorded about Revd De Putron, save that he trained at University College Durham and was ordained in 1892. The use of terracotta blocks, rather than the usual flint, carrstone or brick, makes St Peter’s church unique in Norfolk. This is particularly true as the blocks are themselves partly bespoke, varying in shape and size according to their function. The lower courses have a brown glaze, and above this the bricks are of varying yellow colours. Those that form windows and door dressings or the battlements of the tower are specially made from moulded blocks. The bricks fit together by engaging the lug on one brick to the recesses moulded into the next. The interior is unusual in that the timber-frame, around which the terracotta walls were built, is exposed in its entirety. It is this frame that takes the majority of the weight of the roof, not the terracotta walls. The church contains a Norman font removed from Stow Bardolph church of the Holy Trinity (NHER 2433) in the 19th century and found in use as a flowerpot. The communion table was used by the Rev J Adams in the Second Afghan War, (1878 to 1880), the first chaplain to be awarded the Victoria Cross. Ruth Fillery-Travis (NLA), 6 February 2006.